I’ve been sat here for twenty five minutes listening to Scott Kelly’s second solo album wondering how I can possibly put any critique of the Neurosis mans record into words. Like his main venture this music is so elemental, so intrinsically earthbound but simultaneously otherworldly that it defies any sort of narrative let alone an adequate one. This is Scott Kelly and his acoustic six string, occasionally accompanied by bass and lap steel guitar and it is a raw, poignant record he has made. The melodies are simple and elegant, they speak of the great North American landscape, of personal loss and deep down, a slight optimism. 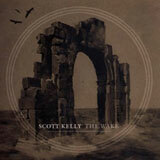 Ultimately the true triumph of this record are Scott Kelly’s vocals. They are raw and personal, rendered in a way that is so open, so candid they’re truly moving. To anyone with an interest in the absorbing, linear maturing of Neurosis will be forever affected by this record, it’s honesty comparative to the later day recordings of Johnny Cash. Should you doubt my comparison just listen to him sing “The weather never changes in my world”. This album will stay with me for quite some time.